Today marks the start of a Scotland-wide campaign to raise public awareness of the signs and symptoms of sepsis, through a successful partnership between FEAT and the Scottish Government. This national campaign, which FEAT have been delighted to help finance, will hopefully significantly raise public awareness of sepsis throughout the length and breadth of Scotland – a truly national campaign. Watch out for it featuring in the local press, on radio, on facebook, in the Big Issue, and in surgeries, pharmacies and hospitals across Scotland over the next month. To highlight the dangers of sepsis, Craig Stobo, founder and chair of FEAT joined Health Minister, Shona Robison today to meet teams of healthcare professionals at University Hospital Wishaw in North Lanarkshire who have developed an innovative early-warning system for the early diagnosis of patients with sepsis and ensure arrangements to treat them are in place at the hospital on arrival. Craig Stobo said: “This is a milestone day for sepsis awareness in Scotland. 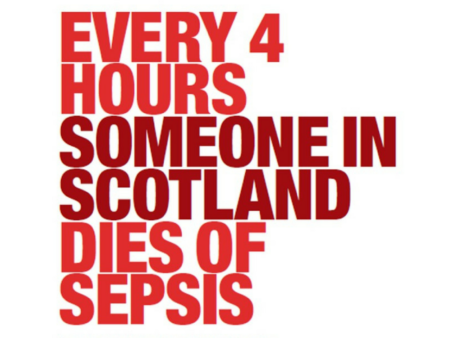 FEAT, Scotland’s Sepsis Charity, is delighted to be launching this nationwide campaign in partnership with the Scottish Government. We have pressed for the need to raise awareness of this killer condition and are confident that this Scotland-wide campaign will be a gamechanger in increasing the public’s understanding of the symptoms of sepsis and the quick action needed to save lives. In hospitals, GPs surgeries and pharmacies across Scotland, people will see posters and leaflets funded by FEAT as well as a comprehensive Facebook campaign explaining the key symptoms of sepsis, the advice to seek urgent medical attention and to ask: “Is it sepsis?”. Having lobbied for some time for a national campaign, it is wonderful to see this launch today. Why not sent us a picture via our social media when you spot any of the campaign materials, letting us know where you saw them?